Big storms are a bit like a box of Cracker Jacks for birders, especially in New Jersey. Because they're accompanied by strong winds, hurricanes, especially, can potentially bring avian visitors who are either avoiding the tzimmes or blown along with the weather front. It's a great opportunity for those who don't travel much to see birds that rarely -- if ever -- show up here without a push from Mother Nature. Some have opined, for example, that the crested caracara hanging out in West Windsor in September was seeking refuge from a large storm well to our south. Hurricane Sandy is predicted to be a mammoth storm -- which is why I'm drafting ahead of time, in case I lose power or can't otherwise get to the internet. Based on the current storm path predictions, our birding buddies are already offering thoughts about what types of birds could find their way here. Given that we're also in migration season, things could get pretty interesting. Even if you're not a birder, or are just starting out, keep an eye and ear out for unusual sights and sounds after the storm. You never know if your backyard or local park might attract a southern bird, or a pelagic (ocean-dweller) that got blown off course. If you're not sure what you're looking at, the Cornell Lab of Ornithology hosts a great website that can help you identify your visitor. Let us know if you see anything unusual... but above all, stay safe! Over a dozen significant historic attractions in close proximity to each other: it's a New Jersey booster's dream and challenge. Union County's Four Centuries event makes it easy to step back in time to get a broader understanding of the region's contributions to the country's development and growth. Thing is, when you visit five Colonial-era houses in less than four hours, you tend to be exposed to a lot of the same types of artifacts. I've seen my share of chamber pots both decorative and functional, reading lamps that affixed conveniently to ladder-backed chairs, bed warmers, foot warmers, cast-iron plates, you name it. Don't get me wrong: museum docents should point them out, as it might be the first time a visitor has ever seen them, but me, I've seen so many it's as if I grew up with them (which I didn't, incidentally). I'm proud of my state's history and heritage, but at this point, I'm looking for something a bit more distinctive. I found it at the Drake House in Plainfield. 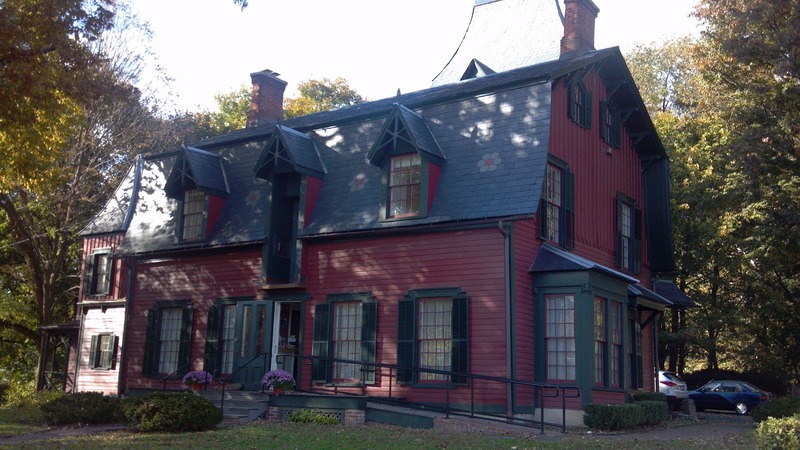 House museums take one of two curatorial approaches. Some focus on a single era, so you can better understand the lives and times of a particular family, or perhaps what a notable visitor or resident might have experienced there. Others present a much wider scope or time frame. The Drake House does a mix of both, reminding visitors of Plainfield's rural beginnings and its later status as a mid-19th century resort for wealthy New Yorkers. The story begins in 1746, when Isaac Drake built the house for his son Nathaniel, who married and had several children. Supporting the family's patriotic bent, three of his sons served in local militias, and their freed slave Caesar was a wagoner for the Continental Army. The home gains added significance for having briefly hosted George Washington during the Battle of the Short Hills in 1777. The original lean-to kitchen still includes a broad hearth and a column which would have been knocked out of place to collapse the roof and separate the room from the rest of the house if there were an out-of-control fire. Additionally, the dining room and a back bedroom are furnished to reflect 18th century decor. Early Victorian times are reflected in the parlor, with a trove of furnishings and some fascinating knick-knacks. Manhattan Banking Company President John Harberger bought the home from the Drakes in 1864 and then added more rooms with contemporary touches. One can't help but notice the shiny brass signal cannon in the corner, formerly owned by his neighbor, Central Railroad of New Jersey employee Loyall Farragut. You may have heard of Loyall's father, Admiral David Farragut, who served in the US Navy during the Civil War and is best remembered for shouting, "Damn the torpedoes... full steam ahead!" in New Jersey and elsewhere. Victorian decor sought to bring the outdoors into the house, and the Drake is no exception. 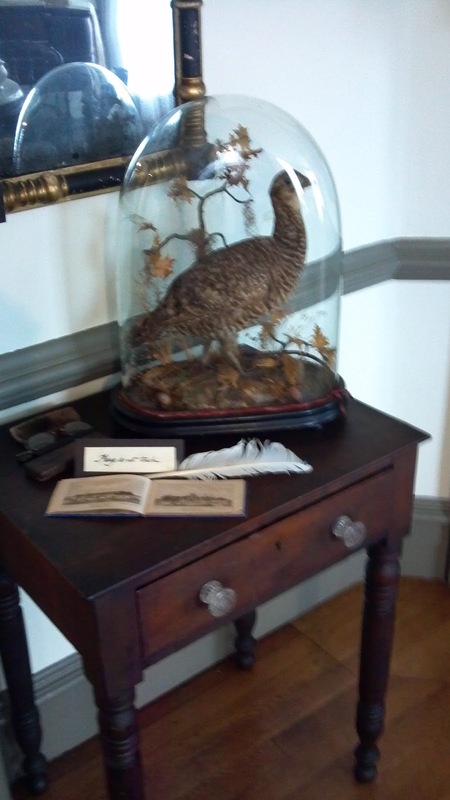 A taxidermied heath hen is displayed under a glass cloche, representing a once common but now extinct species. According to our guide, the Smithsonian has often asked the Plainfield Historical Society to part with it, to no avail. I was happy enough to be able to appreciate this long-gone bird skillfully preserved. You don't see much wild fowl of any kind -- but for turkeys -- wandering through the woods or fields of New Jersey anymore. The real treat of the day is sequestered in the Harberger Library in the back of the house. While Victorian furnishings and period wallpaper make for an impressive sight, they pale in comparison to the seven-by-nine-foot oil painting that essentially takes up one wall of the room. 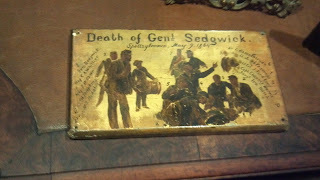 The Death of General Sedgwick portrays the final moments of the highest-ranking Union casualty in the Civil War. As the story goes, he was repeatedly warned to duck for cover during the Battle of Spotsylvania Court House, as Confederate sharpshooters were just a thousand feet away and already firing. Sedgwick rebuffed all warnings, saying, "They couldn't hit an elephant at this distance!" Those turned out to be his final words, as he was struck just below the left eye and perished shortly after. 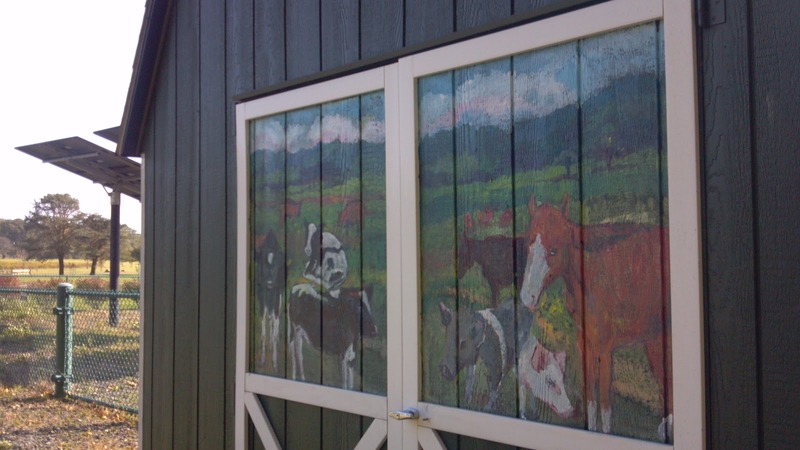 Beyond its size, the painting is striking for the authenticity of its portrayal of the scene, which isn't surprising because it's the work of a noted Civil War veteran. Julian Scott was just 15 years old and a fifer with the 3rd Vermont Infantry when he was awarded the Congressional Medal of Honor for saving several of his combat brethren. Injured in the war, he studied painting at the National Academy of Design and under the tutelage of Emmanuel Leutze, painter of the famed Washington Crossing the Delaware. Scott eventually opened a studio in Plainfield and became well known for his stirring and realistic portrayals of combat and its aftermath. He died in Plainfield in 1901 and is buried in Hillside Cemetery, Scotch Plains. All told, I got a lot more from my visit to the Drake House than I expected to, and I barely scratched the surface of the museum's representation of Plainfield as a summer resort. I'll be delving into that in a future installment, so stay posted! That headline isn't a typo. Yes, we found ourselves journeying to the EARTH Center. Who'd think it would be in North Brunswick? Okay, okay... I'm playing around a little bit, but when Ivan and I saw a small brown sign pointing us to the EARTH Center off Route 130, we had to check it out. Neither of us had heard of it before, and, well, it was a brown sign, which designates a park. We'd had a largely unsuccessful morning of birding, so maybe scouting a new location would perk us up a bit. The Brunswicks can offer some interesting surprises. While easy access to the Turnpike and Routes 1, 18 and 130 has fostered a great deal of development, pockets of bucolic scenery and farmland are still scattered about the remaining open space. Our trip to EARTH brought us past a few houses on winding Riva Avenue, but we soon found ourselves at the scenic Davidson's Mill Pond Park. The park itself has a couple of lovely ponds and the stone remnants of the foundation of its eponymous mill. It's a nice place to walk your dog, have a picnic or just sit and meditate on a nice day. We, however, were more driven to find out what all of this EARTH stuff is about. 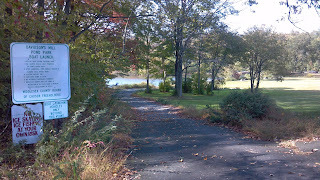 The answer, as we saw from a directional sign, was past a wooden gate and down a paved drive, so we parked by the Mill Pond boat launch and started our stroll. Almost to the EARTH Center! 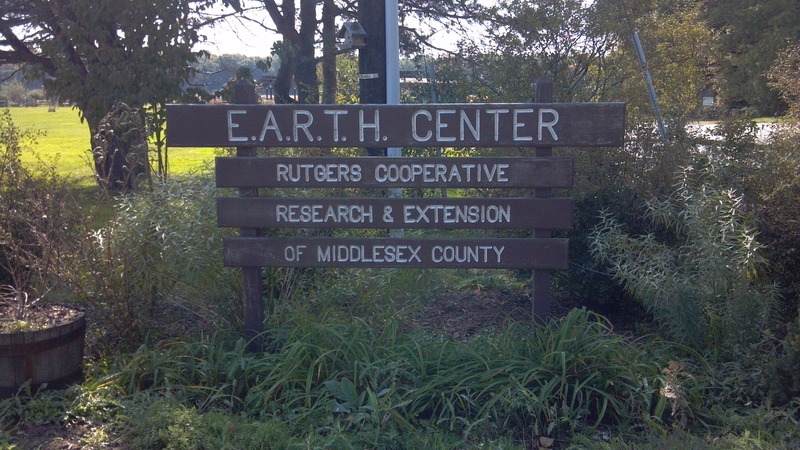 EARTH, as it turns out, is an acronym for Environment Agriculture Research Teaching Health, and the center is part of the Rutgers Cooperative Extension. As you might now, each county has an Extension of the larger New Jersey Agricultural Experiment Station. Basically, it's the public outreach arm that Rutgers operates to fulfill its obligation as the state's land grant university. Each Extension offers an array of classes and educational services on topics like gardening, home economics, nutrition, horticulture and the like. They're a good resource if you can't figure out why your tomato plants aren't producing, if you find an invasive species in your yard that defies identification, or if you're looking for an environmentally sound solution for a stink bug infestation in your house. We seemed to be the only birders at EARTH. While we were getting a lay of the land, a few people came by, walking their dogs or checking out the short trails meandering through the woods, but no one had binoculars. We were also the only people who showed any curiosity about the solar installation, cultivated rain and butterfly gardens, and the small building that looked like a kids' clubhouse. Ivan was on the lookout for sparrows, so he was drawn, magnet-like, to the large acreage of grasses beyond. About five feet high and gone to seed, the grasses were sectioned off with flexible fencing and labeled in a way that seemed to denote the nutrients they'd been given. Some got commercial fertilizer, while others got compost or manure, or nothing at all. It looked like a good experiment to teach kids about cultivation techniques. We weren't seeing many birds, but then it was midday and they were probably laying low for the next several hours. Just as we were reluctantly agreeing that our time there was only a reconnaissance mission for future visits, sparrows started to emerge. One would pop up, fly 30 feet or so and duck back down into the growth. Occasionally one would perch on the fencing for a minute or two before going back into hiding, but for the most part, we had to try to identify them on the wing. We had more luck near an open-air structure several feet away. A host of savannah sparrows and phoebes bopped around in the open, allowing us to get a good look for a few minutes before they went back into hiding or flew away. Noting a stand of pine trees in the distance, Ivan went to check for signs of owls while I found a bench and quietly took in the surroundings. 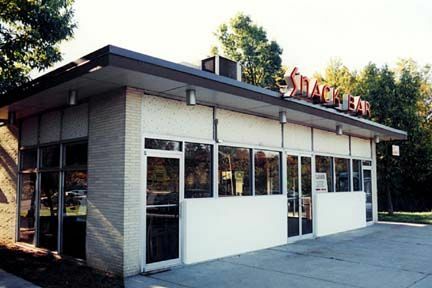 How is it that we'd never heard of this place? It looks to be great habitat for grassland birds, and raptors should also be around, drawn by seed-eating rodents. Some other birder had to have found it before us, yet it hasn't shown up on any lists or bulletin boards. Was it our own little discovery? Right now, it seems to be. Regardless, we'll be returning to EARTH sometime soon. It's inevitable. Below Newark's Raymond Boulevard and University Heights, there's a step back in time that many people outside of the city don't know is there. I recently took a few hours to check it out, and as with most of our jaunts, I found more than I expected. First, I have to confess to being somewhat of a transit enthusiast. If you've read my tribute to Newark Airport's 1935 terminal, you already know I have a fondness for vintage places where you can get from point A to point B in some sort of conveyance. Newark Penn Station is another 1930's-era Art Deco masterpiece, and when I worked in the city, I loved my twice-daily walks through the heavily-used but little appreciated gem. My first trek on the City Subway was in 2001, prompted by the impending retirement of the old 1950's era trolley-like cars in favor of 21st century light rail. NJ Transit opened the system up one night, giving free rides to all comers who wanted a last dose of nostalgia. Yup, it was me and a bunch of foamers -- do I know how to have fun on a Friday night, or what? Despite the fact that the old cars were painted in bright NJ Transit colors, the whole experience was a throwback. It wasn't hard to imagine the times when Public Service Transport operated surface trolleys, and commuters from Bloomfield and the 'Newark suburbs' counted on the City Subway to get to their jobs at New Jersey Bell or an afternoon of shopping at Bambergers. 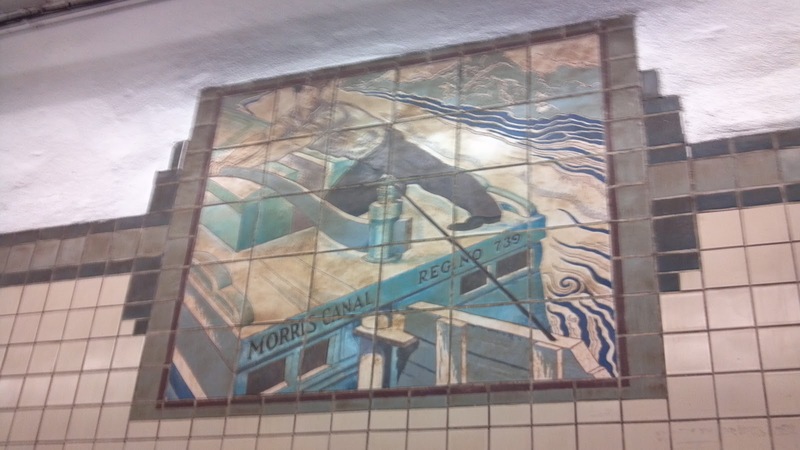 The Newark City Subway runs on the former bed of the Morris Canal, which originally ran through the city on its route between Phillipsburg and Jersey City. Abandoned by 1924, the canal had become a mosquito-infested trough and a barrier to the flow of increasing downtown traffic. Where barges had once transported the products of Newark's factories to points west, trains would now move people underground, allowing motor traffic on the new Raymond Boulevard above. Public Service had already built an extensive transit center on Park Place, providing a convenient transfer point to trolleys and buses going virtually anywhere in the state. Subway construction began in 1929 and was completed in 1935, with an extension to Penn Station finished a few years later. Beyond the Warren Street station that serves Rutgers and NJIT, the line goes to surface, making one grade crossing and hugging the edge of Branch Brook Park before terminating at Grove Street in Bloomfield. As was the case with many major public works during the Great Depression, WPA artists made their mark on the City Subway. The line's four underground stations are graced with tile murals created by Newark native Domenico Mortellito, who'd grown up not far from the Morris Canal. Each depicts one of his childhood memories of the waterway, except for the Penn Station murals, which portray the transformation from barge to railway, complete with steam shovels and laborers moving iron beams into place. Together, the 10 murals represent the first instance of public art used in an underground transit system. Yup... you've got it: another New Jersey first. I wasn't just there for the vintage stuff: there's more contemporary art to be found, too. 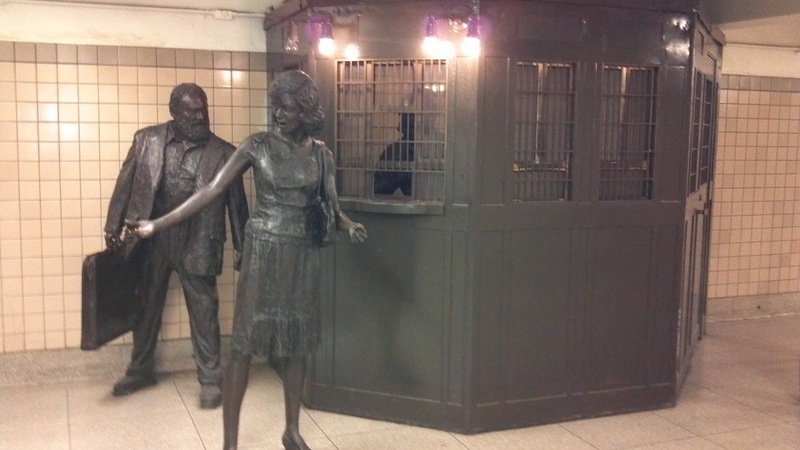 As you enter the system at Penn Station, you're met by life-sized bronze commuters sculpted by Russian-born Jersey City artist Grigory Gurevich. A metal clerk stands inside a sizeable booth, presumably offering change for the turnstiles that once marked entry below. My personal favorites are found sitting unobtrusively at the Branch Brook Park station. 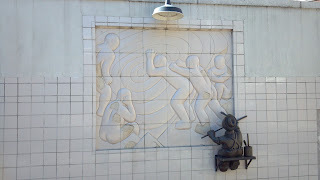 Sculptor Tom Otterness pays tribute to Mortellito with white tile representations of two of the underground murals, attended to by small brass workmen. It's a whimsical memorial to an accomplished artist whose works also graced Rockefeller Center and the 1939 World's Fair, among others. Inadvertent as it may be, NJ Transit has done a pretty good job of maintaining a vintage feel on some aspects of the underground. They've added modern signage as necessary, but they've left the old tile signs that direct riders to surface streets and other destinations. Disembark at the Military Park station, and you might see a tile pointing in the direction of the Public Service Terminal. It's been more than 30 years since that building was demolished, but the sign will still direct you toward PSE&G's headquarters location. Oh, and one last thing: if you're going to play tourist on the City Subway, you can do it really economically. The system works on the fare ticket system, where you validate your own ticket at your entry point, rendering the ticket useful for 60 minutes. A ride from Penn Station clear out to Bloomfield takes less than half that time, so you could potentially get off at a given stop, take a quick look around the neighborhood and pop back onto the next train without having to pay another fare. As far as I can tell, it's perfectly legal. Regular readers know that I volunteer for the National Park Service and a non-profit organization called Save Ellis Island. Besides getting me into some pretty cool behind-the-scenes situations, I get to learn more about the Immigration Museum and the Statue of Liberty than most people would ever think to ask about. Many of the rangers are more than happy to share details they unearth in their own research. Sometimes that leads to weird coincidences, like when a ranger discovery crosses a Hidden New Jersey jaunt. It happened just the other day, when one of them pointed out that a bust in the building's library portrays New Jersey rubber magnate Richard Butler. What does a manufacturer have to do with a national park? Good question, and I thought I knew the story. 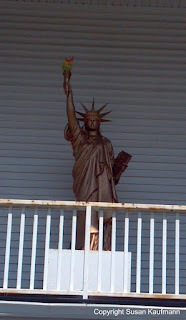 You might recall that a few months ago, Ivan and I learned about Butler after discovering a replica Statue of Liberty in the Morris County town that bears his name. The borough also has a street named for the Statue's sculptor and Butler's close friend Auguste Bartholdi. Since my research didn't come up with much more of a connection, I'd figured that the replica Statue was yet another tribute. Well, apparently I should have looked at it from the opposite direction. Butler wasn't just a friend, he was the Lee Iacocca of his time, playing a major role in raising funds for construction of the Statue's pedestal. As secretary of the American Committee for the Statue of Liberty, he also donated the services of his rubber factory to ship miniature Statues to contributors. In recognition of his service, the French government named him a Chevalier of the Legion of Honor. I wish I could say that the fundraising statuettes were manufactured in Butler, but that honor went to the Newton Bottle Stopper Company of New York. Marked with the name of the committee that sold them, the six- and twelve-inch tall keepsakes are no doubt valuable collectors items today. 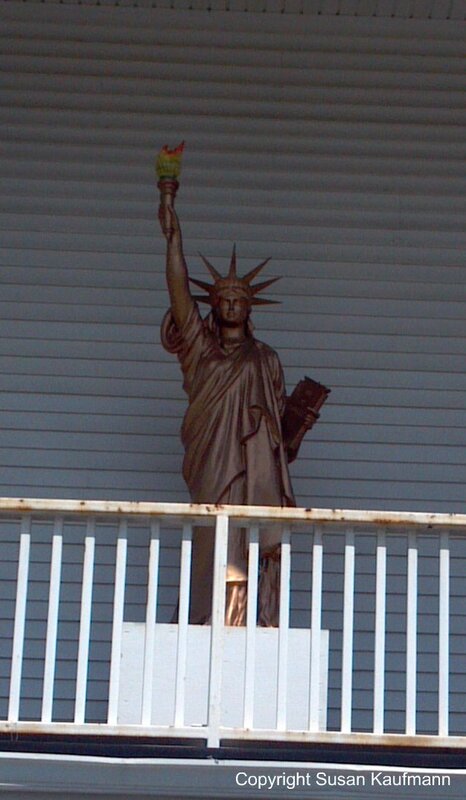 The provenance of the Butler police station Liberty is still a mystery for us. Did Richard Butler purchase it for the borough, or is it a newer addition to the community? 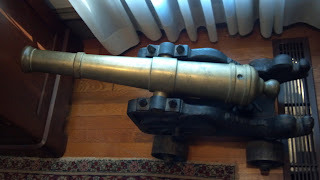 Various larger-sized replicas were cast in France, but lists of their possible locations don't include New Jersey. We'll track it down someday. 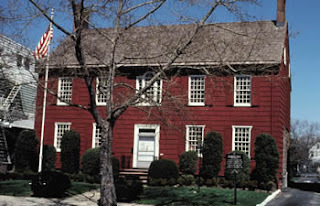 There are some Hidden New Jersey discoveries that seem to resist an easy explanation. I’ll run into something interesting or unusual, make note of it, maybe take a photo, but my follow-up research draws a complete blank on first examination. I don’t usually share those instances with you because, well, I feel responsible for giving you at least some of the story of the things Ivan and I discover. But then there are sometimes things that are more fun in the conjecturing than they probably are in fact. Things like Old Rudetown Road. 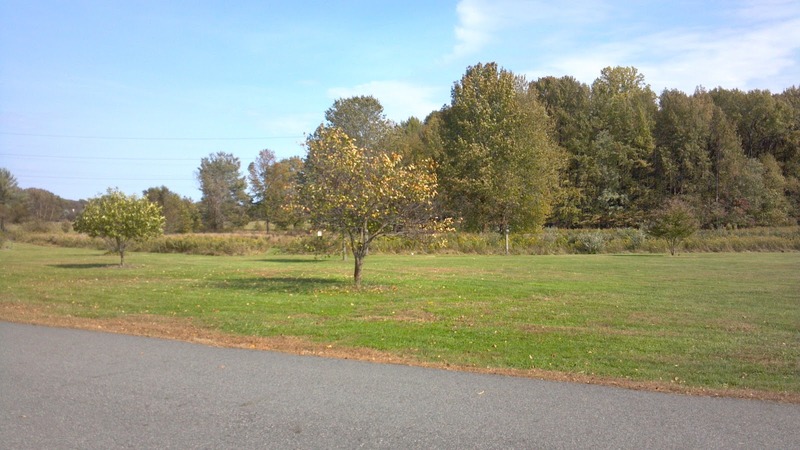 I was bopping around Sussex County when I veered off Route 23 and onto Route 94 into the Vernon/McAfee area. It’s pretty country with the leaves starting to turn fall colors, but I wasn’t finding a lot of unusualness to prompt me to stop. What I needed was something compelling to get me to head off the highway. There it was: a street sign for Old Rudetown Road. Rudetown? That needed some examination. There doesn’t appear to be any actual community called Rudetown on the map, but who knew? Maybe there was some sort of historic marker. Sussex County is good at marking stuff like that, so it was worth checking out. If you have any experience wandering the roads of this state (or probably most any other), you’re accustomed to seeing the “-town” suffix on street signs. Taylortown, Pumptown, you name it. They’re usually vestiges of tiny communities that were swallowed up long ago by larger townships, and noted now only possibly by a gathering of buildings at an intersection that once served as a village center. Rudetown, however, doesn’t appear to be one of them. If it ever existed, there’s no convincing sign of it left. After passing a few businesses, I traveled by the occasional house, but for the most part, Old Rudetown Road was just a back road thoroughfare, one lane each way, with very few intersecting streets. I’d have turned around before I reached its end at County Road 517. It didn't seem very rude at all, unless you counted the driver following a bit closely behind me. Because I didn't have much room to stop, I couldn't get quick photo of the street sign or pull over to do so, not unless I wanted to be rude, myself. And who knew? If my stopping caused a delay for the driver behind me, would he flip me the bird? As I drove back to Hidden New Jersey HQ, I mused over the mystery of Rudetown. Why would a town have such an unpleasant name? And why did it (apparently) disappear off the map? Perhaps the people there were so rude that they couldn’t find spouses, so they eventually died out, their homes rotting to the ground and their property reverted to the county for non-payment of taxes. It appears the answer is a bit less dramatic. An detailed internet search revealed genealogical data indicating that a family named Rude lived in the larger town of Hardyston in the 1700s, likely lending their name to the area. It makes sense, and I should have figured that, but, well, I let my sense of fun get away from me. You've gotta admit: it's more fun to consider that there was once a time where all of the unpleasant people in the state could find refuge in one small town named in their honor. Ever find a great name in your travels? When you spend a good bit of time in historic buildings, you start to notice the anachronisms. You know, the current day things that shake you out of the pretense that you're actually seeing the place the same way it looked to the people who made history there. Usually, they're things like fire supression systems or safety lights: items placed to protect and preserve visitors, the building and its contents. Most of the hardware is obscured from visitors' eyes, leaving only the necessary working parts in view. There's generally some level of respect and consideration. Other times, they're just thoughtless additions. During my college days, I despaired at the sight of red "No Trespassing" (or words to that effect) stickers slapped on the doors of Rutgers' most historic structures. Really, guys? Granted, these buildings are in active use, but there's no other way of getting the message across without defacing history? I made occasional visits to Princeton when I was going to Rutgers, and while I will always bleed scarlet red, I was tremendously impressed with the older Princeton University campus buildings. The oldest building, Nassau Hall, had, of course, been the meeting place of the Continental Congress in the early 1780s, and had suffered damage from British gunfire. Regardless of college loyalties, you have to admit that's pretty cool. Rutgers, of course, has a similar building, Old Queens, and while it's about 70 years younger than Old Nassau, it too houses university administration. I'd never had occasion to venture inside, and to be honest, I was a little frightened to just open the door and walk inside. I never had university business there, and, well, there was the matter of that red sticker, right? Most of my Princeton visits were made at night, but I once found myself there in the late afternoon during the week. Maybe a visit to Nassau Hall was in order? I tried. The doorknob turned and the door opened into a large lobby. Once inside, I saw the walls were adorned with the names of Princeton graduates who had died in the service of their countries in wars back to the Revolution. As I later found out, the building itself could be considered a veteran, as it served as both a barracks and a prison during the Battle of Princeton in 1777. I was up to the World War casualties when I heard steps approaching. Oh, no, a guard. Was I trespassing? I figured the best thing to do was to apologize, but apparently there was no problem. "I'm just closing up for the day," he said. We chatted about the building for a few minutes as we walked to the front door and stepped outside. He seemed to have a real interest and respect for Old Nassau, and he appreciated that I did, too, but he couldn't talk for very long. He had his rounds to make, so he had to lock up and be on his way. "They'd kill me if I lost this," he said, pulling the door key out of his pocket. It was large, obviously quite old and still effective, as he inserted it into the ancient keyhole and gave it a twist to secure the entrance. Yup, they were still locking up their oldest building with what appeared to be original (or close to original) equipment.